About fourteen years ago I started to think about chickens. 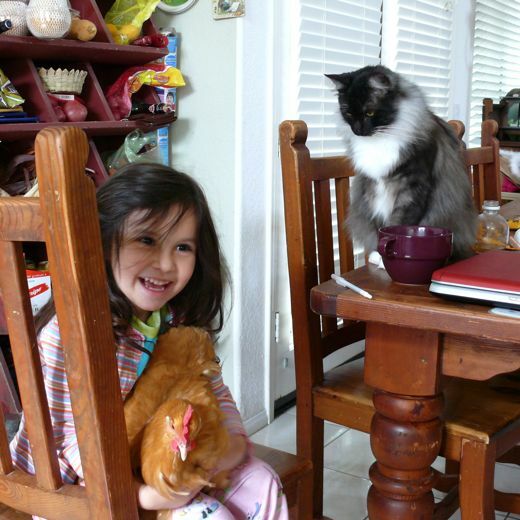 I started to recall, fondly, that when I was a child we had chickens. We also had a barn and two acres of land, so having chickens made sense. Fourteen years ago my own family was far from any farms, living in a small two bedroom house. 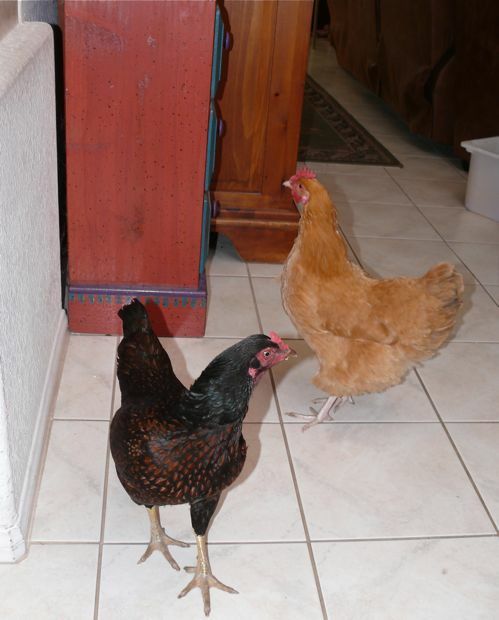 No one thought my fond recollections of having chickens were interesting or worth pursuing. Still I could not stop thinking about chickens and really my thoughts were becoming an actual plan to get chickens. I wanted to see their ruffled feathered forms in the yard. I wanted to hear their clucks and chuckles, their cackles. Nothing could discourage or dissuade me, and there were a lot of people that wanted to discourage and dissuade me. They pointed out all of the drawbacks of raising backyard chickens, like messes and noises and smells, and messes and noises and smells. Their sermon preached and repeated the same unholy chicken trinity: Noises, messes and smells. Naysayers. I listened to them. I heard them. I knew they were probably right, and I smiled politely, trying to reassure them that I was not about to behave rashly. But I was about to behave rashly. I was waiting for the moment to be ripe, for the impulse to mature to obsession, for the obsession to bloom in to full scale action. I was patient and determined. I was going to have chickens. In 2000 PBS aired a program that absolutely confirmed my affliction affection for chickens. "The Natural History of Chickens" embodied the humor, the sensitivity, the practicality, the whole picture of chickens and people's history with chickens. And even though I enjoyed laughing about the "extreme" demonstrations of love and respect some people have for their feathered friends, I was also startled to realize that it was all terribly attractive. That will be me some day, I thought with some awe. I will be a crazy chicken lady. It was not a decision; it was a premonition. I remember how much I wished we could have a copy of this great film, how much I wanted to view it again and keep a copy on hand... a happy substitute for the real thing. My day has come. I have my hen. I will have more again, when we have our own place. I do not consider myself a crazy chicken lady. Not yet. But perhaps by some people's standards I have arrived. The chickens do not come in the house. Well, not often. In fact this visit was a certain rarity, and we were amused by their curiosity, and by Benjamin's indignation. Lady Betty Orpington makes me happy. And it's not that I think everyone should have chickens, because, really, they are noisy, messy and smelly, but what I do think everyone should have is an affinity for something in the natural world that makes them happy. Everyone should have the pleasure of connecting with a garden or a pet, with the forest or the ocean, and see it with all of its beauty and flaws, its strengths and its perils and in spite of whatever challenges it presents we should extend ourselves to foster a relationship. It strengthens my mind, body and spirit to be in the ocean or walking in the woods, and it does the same for me to hear Betty in the garden, to follow her and care for her, to learn about her. I do not have any illusions about what she is, and I am not even opposed to roast chicken... I think that is another reason why I enjoyed filmmaker Mark Lewis' film; he demonstrated an affection for his subject without oversimplifying the complexity of the issues or forcing an agenda. The film was funny, maybe silly truthfully, it was entertainment-educational. The DVD is available now, and the program is airing on PBS this week. I cannot wait to see it again. With Betty? No, it'd be passed her bedtime. The more I visit your blog, the more I'm in awe of your ability to write and tell a story in a captivating way. I really look forward to seeing new posts. And it was very interesting to hear how your chickens came to be. I've wondered about that more than once! JUST in case you do anything rash in the meantime, please know that I am sending you the PBS chicken movie; do you still have a VHS player? And thank you Jennifer... now Betty can watch it any time of day! Just look at Maria's face. It's clear that Lady Betty Orpington makes her happy too! p.s. Where did Lady Betty's name come from? I fully understand the facination for chickens. It doesn't need to be explained or analized :). There is something as you say, endearing about them. Plus all those handy eggs they lay. And music in the mornings if you have a Macho male around the place. 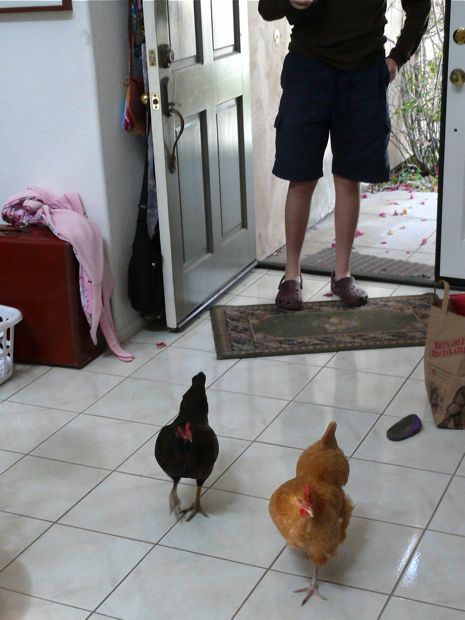 I don't normally allow chickens in the house either. But there has to be exceptions to every rule. Betty is a good girl and the look on Marias face is priceless. I think that says it all. 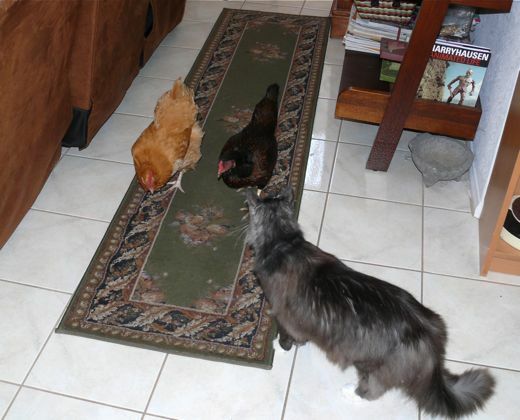 I don't have chickens at this moment but I would give just about anything to have them clucking and pecking out back. SOON VERY SOON!!! I'm getting chickens this week. I'm scared and excited. Some of my friends are laughing at me. I don't care. I'm looking forward to their eggs. Even though I never grew up with them, I'm hoping I can learn! There is nothing like fresh eggs laid from a chicken with all the dirt on it. I haven't seen that happen since I was about 7/8 years old. I grew up on a farm with chickens. Once we had a little chick that hatched and it was not safe for it to be in the coop. My brother and I raised, Chicken Little. He slept in the hamper at the end of my bed. He would greet us when we got off the school bus and sit on a shoulder as we walked up the driveway. Chickens!